In an effort to comply with Ye Old Rules, I'm trying to make nice with some old enemies. Red and Pink don't like me and the feeling is reciprocated twofold. I've tried to like them, but they just don't give me the warm fuzzy feeling I get from cool colors (and yes, I see the irony there). But since it's in the rule book and all, I figured I'd give it another shot. I spent days looking at red beads and red cord and ordered up a whole bunch to beef up my stash. Then I didn't use any of them. 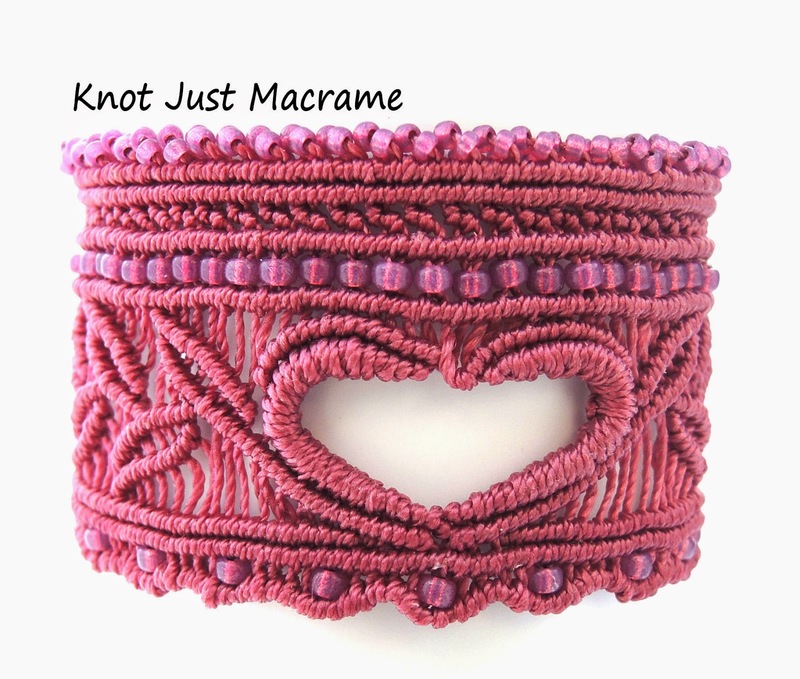 I'm still sort of obsessed with cuffs, so I thought I would expand on that for this project. I did the top the same as the cuffs I designed for the cuff class, but I switched up the main panel. I knotted a heart outline in the center, then brought a leaf and vine pattern off the heart in each direction. It sort of reminds me of a Pennsylvania Dutch design. 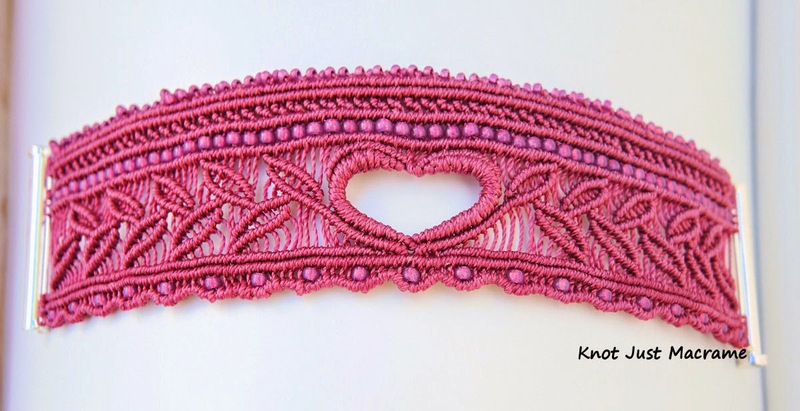 I also added a scalloped edging with beads along the bottom for a sort of lacy finish. I wanted the knotting to be the star of the show here, so I kept the it all monochromatic. And yes, it's pink. Or pink-ish. Take that Red. I think it's quite festive and I'd love to hang around and tell you more about it, but I really have to go order my Valentine's Day candy. This year I'm getting myself some really pretty handmade truffles. What!? It's not that I think I might be "that" person (the one who doesn't get a Valentine's Day gift), but I'm not taking any chances. It is just so perfect,and amazing. I just do not see how you do it, but I am working on it. Beautiful. I hope you win. Gorgeous cuff Sherry. P.S. so is the red double heart from last year.